The term ‘Bootcamp’ actually comes from a basic and intense form of military training, but the fitness industry has taken the bootcamp concept into a training program that is challenging, fun, social and easily adaptable to groups of different abilities. What can I expect from a Bangkok bootcamp? Our bootcamp sessions typically last 1 hour, and after an initial warm up and dynamic stretching session we will do exercises that incorporate strength, cardio, flexibility and co-ordination. We do this with bodyweight exercises, interval training, games, drills and races. Much of this is just done with bodyweight, but we also use some minimal equipment such as medicine balls, skipping ropes, exercise ladders and steps, as well as more innovative equipment that is at the forefront of the fitness industry, such as kettlebells and TRX. The focus of the session is providing a fun and social fitness session that improves your fitness and wellbeing. We run bootcamps throughout Bangkok at Lumphini Park, Benjasiri Park, Queen Sirikit Park and Bann Sansiri on Sukhumvit soi 67. 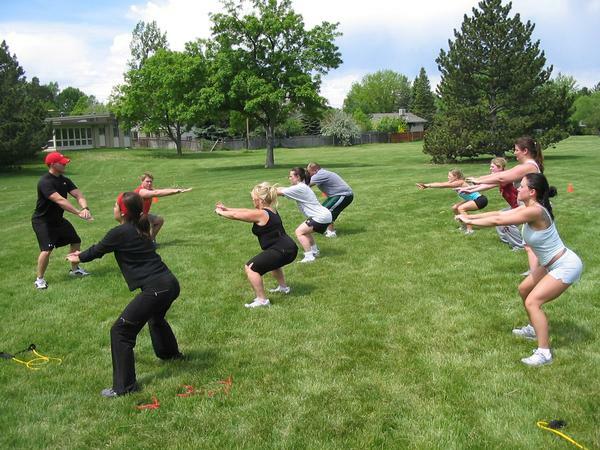 We can also run bootcamps at your workplace or any other open space. If you would like more information on our bootcamp service, please contact me.